The Commission's electoral review of Cheshire West & Chester concluded in June 2018. The aim of the review was to deliver electoral equality for voters in local elections, and recommend ward boundaries that ensure all councillors represent approximately the same number of electors. The Cheshire West and Chester (Electoral Changes) Order 2018, to implement recommendations made by the Local Government Boundary Commission for England (LGBCE) for new electoral arrangements in Cheshire West and Chester Council, was made on 20 June 2018. New ward arrangements for Cheshire West and Chester have now successfully completed a 40 day period of Parliamentary scrutiny and will come into force at the local elections in May 2019. 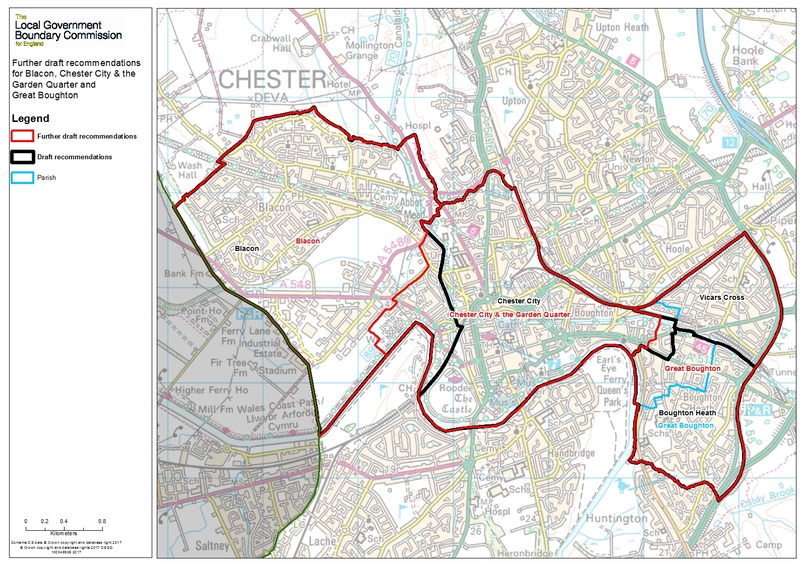 The Order for Cheshire West and Chester can be viewed through the following link. On 1 May 2018 the Cheshire West and Chester (Electoral Changes) Order 2018 was laid in draft in Parliament. Now that that draft Order has successfully passed through Parliament, it will give effect to the final recommendations that were consulted on during the Local Government Boundary Commission for England’s review of electoral arrangements in Cheshire West and Chester, and published on 6 March 2018. On 6 March 2018, we published final recommendations for future electoral arrangements in Cheshire West and Chester Council. 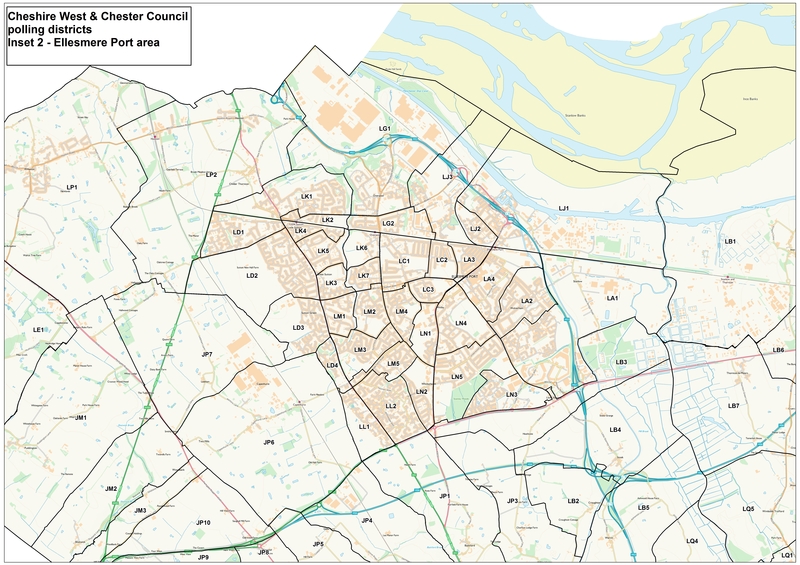 Final recommendations map for Cheshire West and Chester Council - please note: this map is very large and may take some time to download. We have now completed our electoral review of Cheshire West and Chester. The changes we have proposed must be approved by parliament. A draft Order - the legal document which brings into force our recommendations - will now be laid before parliament. The draft Order will provide for new electoral arrangements for Cheshire West and Chester Council to be implemented at the local elections in May 2019. Last year, the Commission held a public consultation on proposals for new ward boundaries across these areas. The Commission has listened to the views put to it during consultation and now proposes to make changes to the plans, to reflect the local evidence received. Due to the significance of the proposed changes in Blacon, Chester City & the Garden Quarter, and Great Boughton, the Commission is opening an extra phase of consultation for those areas, to see what local people think of the new recommendations. We are seeking evidence and views about this part of the council area only. Between 9 January 2018 and 5 February 2018 we are inviting comments on our further limited draft recommendations for those areas. The Commission is satisfied that it has received sufficient evidence to finalise its proposals for new electoral wards for the rest of Cheshire West and Chester Council and will not therefore consider representations about those areas which are not the subject of this extra consultation. The Commission plans to publish its final recommendations for the whole council on 6 March 2018. You may find the electoral figures useful when thinking about ward arrangements. The consultation on draft recommendations closed on 6 November 2017. On 29 August 2017, we published our draft recommendations for the electoral review of Cheshire and Chester West Council. Between 29 August 2017 and 6 November 2017 we invited comments on our draft recommendations. 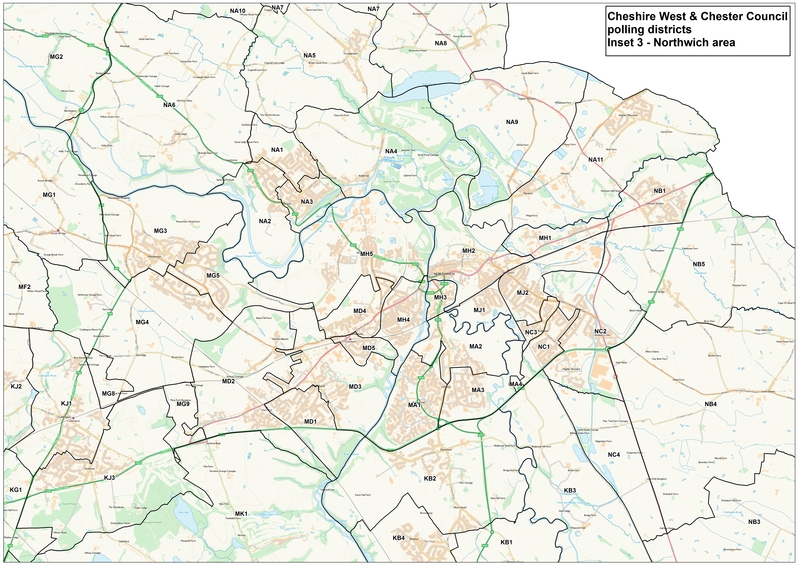 An overview map of Cheshire and Chester West draft recommendations is available. Please note: this map is very large and may take some time to download. All submissions from parish and town councils are combined in the document below. At the front of each document is a list of names with links to the relevant submission. All submissions from local residents are combined in the document below. At the front of each document is a list of names with links to the relevant submission. On 28 March 2017, we started the first period of consultation for a pattern of wards for Cheshire West and Chester Council. Between 28 March 2017 and 5 June 2017, we invited comments on the ward boundaries for the authority. The Commission announced that it is minded to recommend that Cheshire West and Chester Council should have 69 councillors in the future, a reduction of 6 from 75. The Commission needed information from people and groups across Cheshire West and Chester to help it to produce a new pattern of wards to accommodate 69 councillors. For more information, read our news release and the letter to the Chief Executive of Cheshire West and Chester Council. Polling district maps may also be useful when thinking about warding arrangements. You can view the polling district map below. Please note, polling district mapping data has been supplied by Cheshire West and Chester Council and may contain boundary errors. 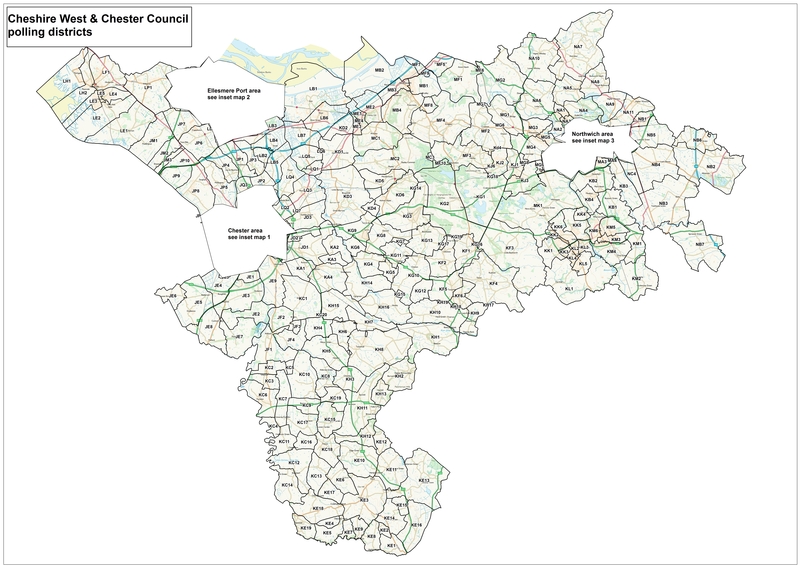 The Cheshire West and Chester (Electoral Changes) Order 2011, to implement recommendations made by the Local Government Boundary Commission for England (LGBCE) for new boundaries in Cheshire West and Chester, was made on 4 January 2011 and published on 7 January 2011. New wards for Cheshire West and Chester have now successfully completed a 40 day period of Parliamentary scrutiny and will come into force at the local elections on 5 May 2011. The made order refers to the same maps as the draft order. On 11 October 2010 the Cheshire West and Chester (Electoral Changes) Order 2011 was laid in draft in Parliament. The draft order if made would give effect to the final recommendations that were consulted on during the Local Government Boundary Commission for England’s review of electoral arrangements in Cheshire West and Chester and published on 13 July 2010. The draft order will be laid in Parliament for a period of 40 sitting days. Parliament can either accept or reject our recommendations. If accepted, the new electoral arrangements will come into force at the next scheduled elections for Cheshire West and Chester in 2011. On 13 July 2010 we published final recommendations for future electoral arrangements in Cheshire West & Chester. These are available through the links below. We have now completed our electoral review of Cheshire West & Chester. The changes we have proposed must be approved by Parliament. An Order - the legal document which brings into force our recommendations - will be laid in Parliament. Parliament can either accept or reject our recommendations. If accepted, the new electoral arrangements will come into force at the next elections for Cheshire West & Chester Council in 2011. Following our analysis of the submissions received during Stage Three, we sought further views in a small area of Cheshire West & Chester. This area covered the proposed wards of Elton, Little Neston & Burton, and Saughall & Mollington. On 24 March we published a press release. The further consultation closed on 21 April 2010. Below are the responses we received to our further consultation. Because of the number of submissions received, we have uploaded these as one document. Please note this document is large and may take some time to download. We consulted on our draft recommendations until 1 February 2010. All the submissions are contained in one PDF document. At the front of the document there is a list of names with internal links to the relevant submissions. All the submissions are contained in three PDF documents, arranged by surname: A-G, H-P or Q-Z. At the front of each document there is a list of names with internal links to the relevant submissions. We received submissions from Residents Associations, Community Groups and other non-political groups and organisations. All the submissions are contained in one PDF document. At the front of the document there is a list of names with internal links to the relevant submissions. Please note that some of these documents are large and may take some time to download. On 10 November 2009 we published our draft recommendations (PDF) for electoral arrangements for Cheshire West & Chester Council. 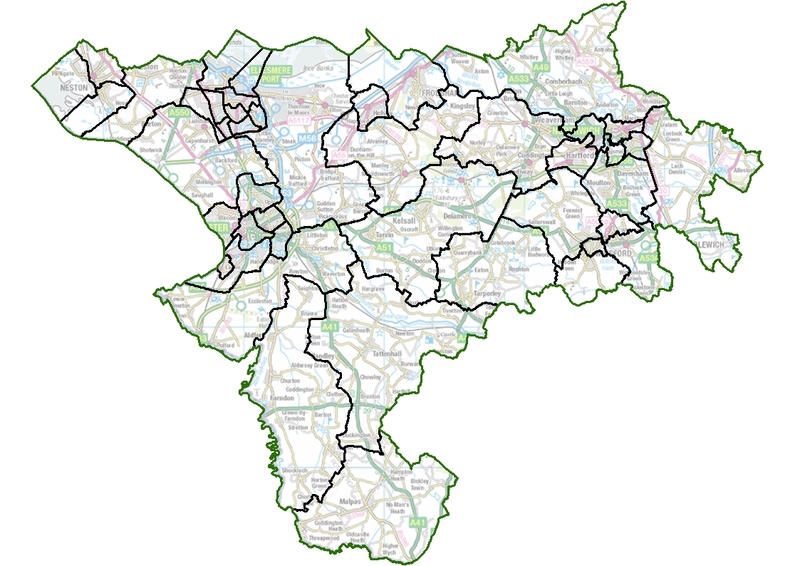 The review is being carried out to decide the number of councillors and the boundaries of electoral wards for the unitary authority which took on local government functions in Cheshire (along with Cheshire East Council) in April 2009. Please note that some of these maps are large and may take some time to download. On 12 May 2009, we started Stage One of the electoral review for the new Cheshire West & Chester unitary authority (ending 3 August 2009), consulting on the pattern of electoral arrangements for the authority. In the previous stage, we consulted on the proposed council size for the new council and decided it should have 75 elected members. Consequently, proposals for electoral arrangements should be based on this. You may find our advice on warding patterns useful. We also provide a map of parishes, a map of unparished areas and a list of electorate figures. On 24 February 2009, we started the electoral review for the new Cheshire West & Chester unitary authority. 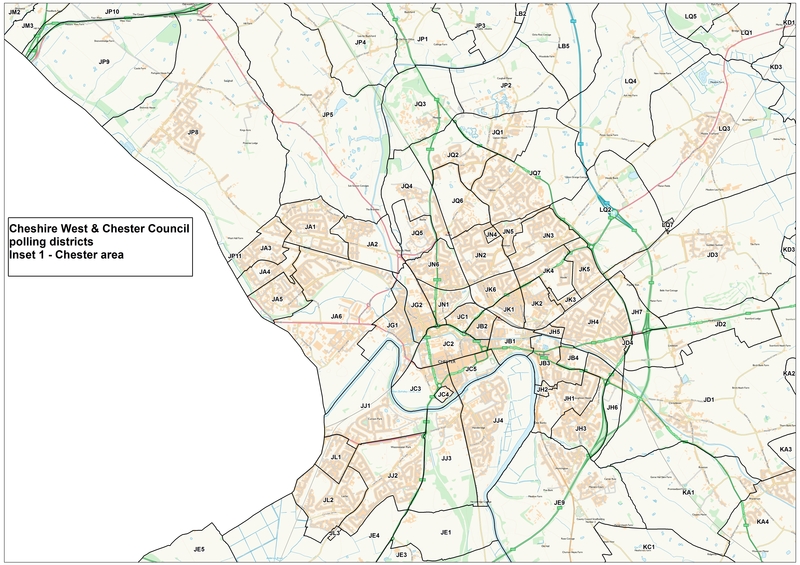 During the current six week preliminary stage of the review (until 6 April 2009) we invited proposals for the council size of the new Cheshire West & Chester Council. We only considered comments on council size at this time, and we will consider detailed electoral arrangements for Cheshire West & Chester during two further periods of consultation later in 2009. We produce electoral review guidance to support people where there is an electoral review being conducted in their area. This is available on the About electoral reviews page. Information regarding past electoral reviews of the Cheshire County Council, prior to it becoming two separate unitary authorities, which replaced the county and district councils on 1 April 2009, can be found here.